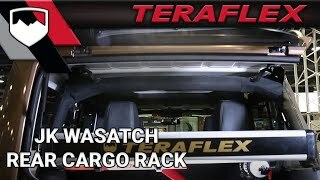 The TeraFlex JKU 4-Door Wasatch Rear Cargo Rack provides additional storage options to organize and secure cargo. Inspired by the Nebo Roof Rack, the rear cargo rack provides universal accessory mounting compatibility. The extruded aluminum rails utilize the industry standard 10-series T-slot mounts that readily accept available mounting hardware for small accessories or recovery equipment. • Extruded aluminum construction for reduced weight – weighs 33 lbs. • Optional Wasatch Rear Cargo Rack Side Panel Kit (# 4820010). • Also available w/ black rails (# 4820020). Awesome product, easy install, and aesthetic fit and finish. The best part it doesn't look like a cheese grater like other racks on the market. I love that i can adjust the height for when i have my ARB 50 Quart refrigerator inside the cargo area. I bought this and read the directions thoroughly and then watched two YouTube video’s on how to install it. After the first four hours of putting it together, I found that I was missing 6 T-Nuts and bolts and a corner piece. I called the company and tried to get a hold of them several times only to be put on hold for several minutes each time. I then emailed them and gave them a bad review. HMMM... I was emailed in minutes and told I would be receiving the missing parts in a week. I received the T-Nuts and corner piece but not the bolts. So I went to HomeDepot and bought six Phillip bolts with the same thread. It took me about another four hours to finish it and install it in my Jeep. When trying to hang it in there to align it, I followed the suggestion of the YouTube video and used flex ties to hold it up. They broke several times because this thing is heavy, real heavy. So I got two ratchet straps and used them to hold it up. That worked much better. Lining up the holes was difficult at first, but once I got a screw in on each side, it went much easier. Let me tell you, it was frustrating at first and pissed me off a few times. The design is not that great. There are 44 T-Nuts and bolts that can get lose and cause it to fail while driving and or off roading. The floor plate is in two pieces and could come apart and cause everything to fall. That at least should have been made as a one piece item. Lining up the corners and all the T-Nuts was somewhat time consuming and tedious. If I had a choice to it over again, I’d get an ACE ENGINEERING or a RMPAGE. Those both are one piece cargo rack racks held up by cross bars that use only four bolts to secure them. A far lot less bolts and nuts to shake lose. And with a little locktite they’ll be ok on the trail. The most frustrating thing i have every installed. Took nearly 3 hours. I would have never guessed that a cargo rack could be such a disaster. 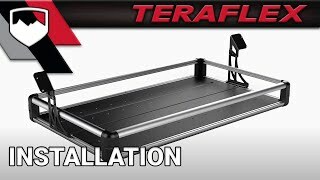 Bought it because the Teraflex brand never dissapoints, but man, this thing is a nightmare to stop from rattling. Tried everything, including completely dissembling and reinstalling with rubber washers. Problem is, when you use over 40 bolts and nuts, its gonna rattle! Sorry guys, but this product is a flop! Just drove (11/22/2018) from Dallas, TX to Steamboat Springs, CO (16 hrs by Jeep). We had two adults and a 7 year old with camping gear for 20 deg weather. 4-season Tent, multiple sleeping pads, multiple sleeping bags, a yeti 35 qt cooler, air bottle for tire pressure adjustments. Blah blah...a ton of crap. What I’m saying is this thing is life saver. I was able to neatly organize and access all of the gear in the actual storage portion of the Jeep without it trickling into the actual cab. It’s not the quickest set up, but once it’s in it’s worth every penny. For reference about 6-8 sleeping pads, rolled up, will fit down inside of it. Worth every penny. *Hint- loctite and torque are your friends. Apply both adequately.